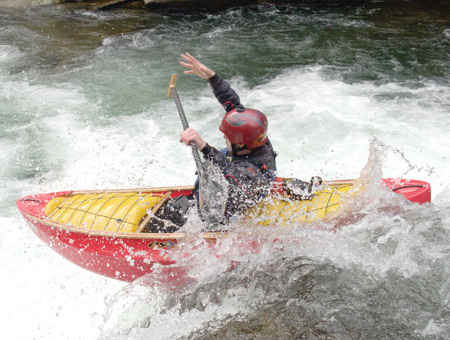 Winter is one of my favorite seasons to paddle whitewater. Winter strips the greenery off a familiar landscape to reveal its bare beauty. Sounds become crisper, the sky appears clearer, and the surrounding area takes on a quiet, furtive appearance inviting you to discover natural treasures unique to the season. Nowhere is this transformation more striking than on the river. So while hibernating inside fuzzy blankets seems like the perfect way to spend winter, here are a few things you’ll discover if you venture outside instead. Humility. You’ll realize how strong (or weak) your muscle memory actually is the first time you flip in frigid water. Generally, the instant reaction is cold shock, where you automatically gasp for breath. If cold water enters one ear, it can cause temperature imbalance between the ears that results in vertigo. In a matter of seconds, you’ve lost air and become disoriented, and you still need to hit your roll. You may know what you’re doing when the water’s warm, but winter will really test your skills. The challenges cold water presents to paddling makes winter the perfect time to step back and really hone technique. Catch every eddy, ferry back and forth across the river, slide up on rocks, do every trick you can think of and roll. It’ll pay off when the weather gets warmer and you step up your game. Solitude. Paddler traffic just disappears in winter. There are no rafts running you over or paddlers blocking eddies: just you, some friends and the river. 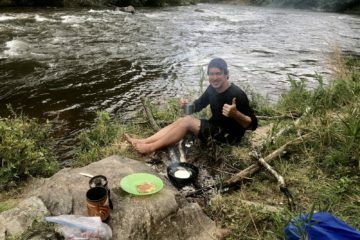 This new level of intimacy with a river strengthens bonds with both nature and your comrades, who are just as crazy as you to put on the water in winter. Ice, ice, baby. Two words: ice undercuts. A wide, open rapid in the summer can be narrowed into a thin strip by ice on one or both sides of the river. The margin for error shrinks. Ice may add danger to a run, but it can enhance the scenery, too. Icicles the size of saplings drape off cliffs, and rocks turn into glass that shines from the sun’s rays. The river and its surroundings transform into a crystalline playground in winter. Your inner child. One of the sweetest and most hilarious joys of winter is watching a toddler struggle to move around in all the extra layers. Though we may laugh, Mother Nature challenges paddlers the same way. The simple lifejacket, swimsuit, helmet, and booties turn into thermal underwear, fleece layer, drysuit, neoprene socks, hardy boots, mega skullcap, helmet, and gloves or pogies. We paddle with a new set of constraints and, like toddlers, feel awkward as we take those first few tentative strokes. 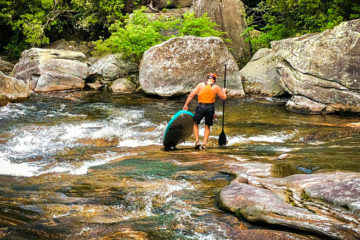 But man, there’s no stopping the paddler once he’s got his gear figured out. Like toddlers, properly dressed paddlers head full on into the winter wonderland until the day ends at the takeout. Life’s simple pleasures. Moods can drop with the temperature. The cold freezes fingers, drains more energy, and sometimes makes a short run feel like a lifetime. I was straight up cranky after a particularly cold and long Big South Fork run one winter. We got to the takeout, and a friend offered me a thermos of hot tea she had stowed in her car. Talk about warming up your insides. Seriously, it was like sunshine in my belly. A pleasant peace flooded my body with that first sip, and my face broke into a huge grin. It was a delicious pleasure made sweeter by the hours freezing on the water under a gloomy sky. Each sip I savored melted my irritation until only joy for the day remained. Hot tea never fails to add cheer to any winter day.